I just love Richelle Mead. Her Vampire Academy series is unparalled, in my opinion, in terms of strong female leads, romance, tension, suspense, action, and plot twists. I was trying to wait to read her Dark Swan series until all four books were released, but alas, I failed. 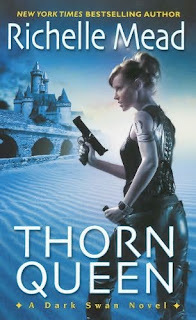 A couple of weeks ago, in the midst of my book slump, which scared my family and friends because I was barely reading at all, I caved and read Storm Born (Dark Swan #1). Yes, I was defeated by the lure of Richelle Mead's writing---a defeat I savored as I raced through the first two books in the Dark Swan series. 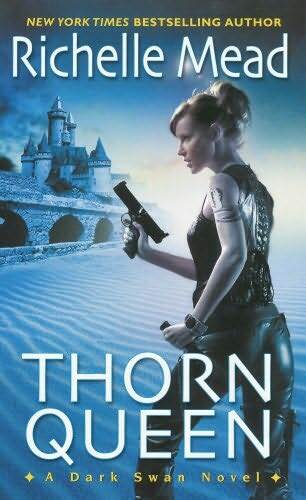 As excellent as Storm Born was, I enjoyed Thorn Queen even more. The romantic tension, the plot twists, the suspense, the tough heroine: all the things I love about Vampire Academy are here in full force in an adult series. I would recommend these books to anyone---they are just that good. And I can't end this review without declaring my team affiliation: I have always been and probably will always be Team Dorian! Down with Kiyo! The way Eugenie calls the fey "gentry" and "shining ones" gets me confused sometimes. Sometimes I actually forget I'm reading about faeries---maybe that's how Mead intended it? That typical Richelle Mead style. Ooo great review. That does sound good.